AND THIS IS WHAT LOVE DOES! We rescued Frizzy in 2005 from a shelter. Her ten days were up. They guessed her age to be between 5 and 7 years. She was found living on the streets. Ninety percent of her hair was gone. She also had black, scabbie skin with an odor. With a change of diet, baths and a lot of love, she grew a lot of hair back. We knew she needed a special name so we looked and decided on “Friseal” meaning to put all of one’s faith in God. That is what Frizzy did over the next six years. She enjoyed living on a farm with all types of critters. She liked going to help feed the horses and bunnies. With the rough life Frizzy had at the beginning, she turned out to be a great little girl. Because of her, I began fostering the breed. 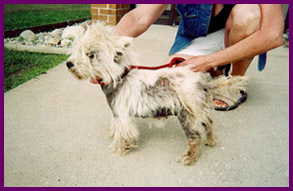 Around Christmas time, Frizzy became really sick and went into kidney failure. After an overnight stay at the vets, she wasn’t strong enough to keep fighting. We chose to let her go to the rainbow bridge after six years of total enjoyment. She lived the best life she could with her playmates. Frizzy liked to rub and scruff her face on the blankets and furniture. 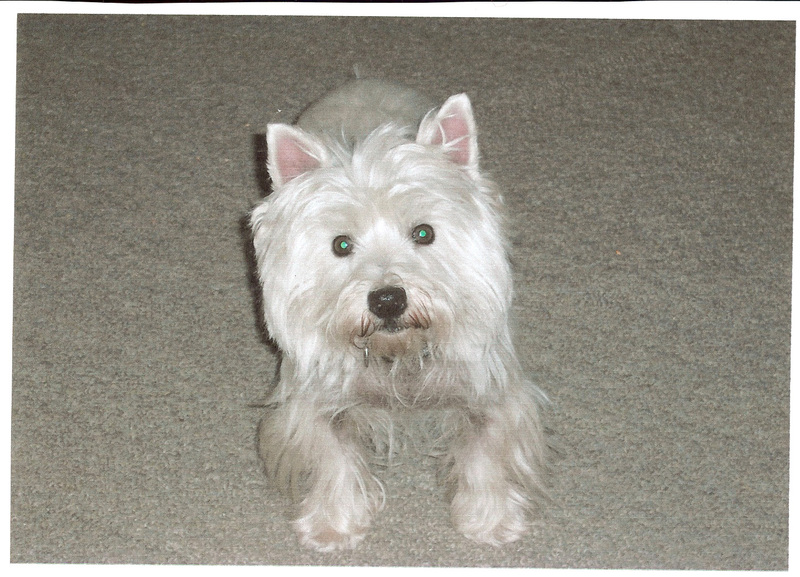 We would go for walks at Frizzy’s pace…until she hit terrier mode…then she could run like the wind. She will be greatly missed by housemates and human family. We were glad to have Frizzy in our lives. We will always love and remember her. She is in our hearts forever. We adopted Cody in January of 2000 though WHWTCSEM Rescue. He had become nervous living with a baby that came into his family, who was now a toddler. I remember sitting with him in the back seat of the car on our way to his new home, and he was just taking the adventure all in stride. He met his new “brother”, Brady at the back door and checked out his new house. I was told he loved his crate, but he was having none of that. The first night he put up a fuss, so I let him out and he ended up sleeping on my pillow next to my head, and that is where he slept every night for the next, almost 12 years. 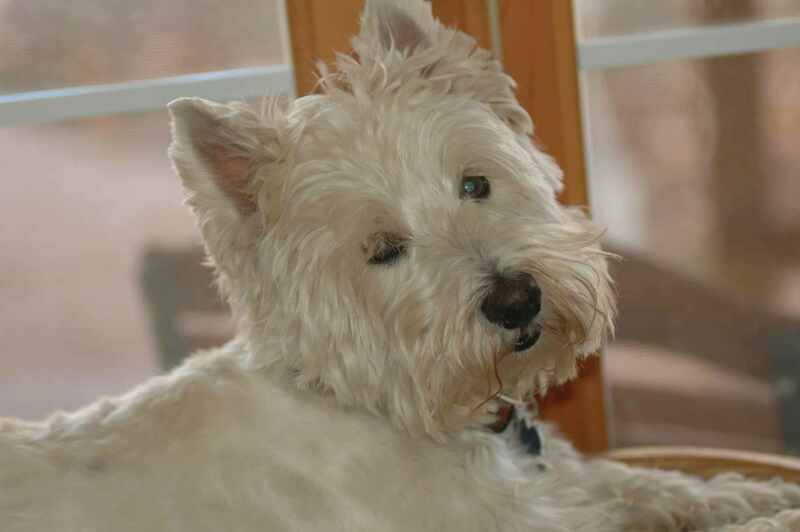 He was very laid back for a Westie and really knew how to relax, sometimes sleeping on his back with all four feet in the air. His favorite thing to do was to lay on the back of the sofa and look out the window…checking out for squirrels and chipmunks. He actually caught two squirrels. Once Brady chased one in the park behind our house and it ran right to a tree that Cody happened to be sitting under. Another time one fell right out of a tree at Cody’s feet! Cody loved it when we moved to northern Michigan. He loved his walks in the woods and always was a few yards ahead of us on the path. He’d kick his feet and take in all the wonderful smells. Cody loved to open gifts. He didn’t care so much what the gift was, but he loved ripping open the paper. A few times he opened things that didn’t belong to him that were under the Christmas tree. He also had an endearing habit of sucking on a stuffed toy. It almost put him in a trance and was something he did daily that brought him comfort. I think he may have been taken away from his mother too soon as a puppy. Cody was my little teddy bear. He would let me put my arms around him and hug him while we slept, and sometimes during the day, he would come to me just to be held and snuggled and get a little tummy rub. When I’d come home he would be so happy, with kisses and wiggles. He had a way of wagging his whole hind end when he was happy. In June of 2011, he came down with oral cancer and it advanced very quickly. We tried a new cold laser treatment, which helped him feel more comfortable, but nothing could stop this terrible disease. He could no longer breathe. After a kiss on the nose for his Daddy and one for me, my sweet, gentle boy fell asleep peacefully in my arms. He’s a few yards ahead of us on that path again. We love you Cody, you will always be in our hearts! 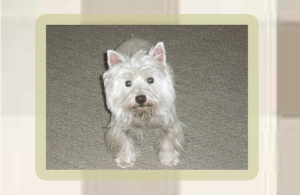 Annie came into Rescue in 2003 when the vet called and asked if we would take a dog who had pyometra Her family could not afford the medical care. Sweet Annie and was adopted by her foster family. Her mom’s moving tribute can be seen by clicking Here. 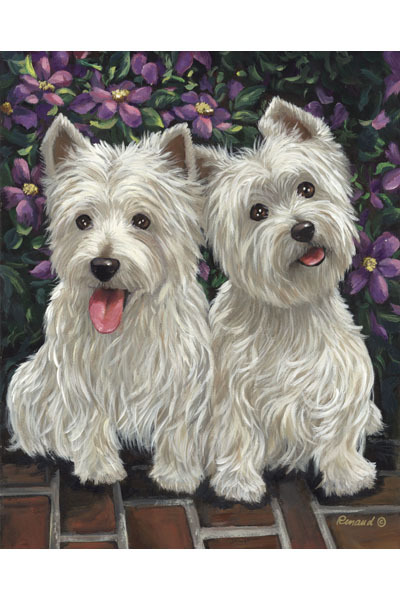 Buttercup was owned by Club Member Carrie Robertson. When Carrie became seriously ill, Buttercup was adopted by an older lady where she enjoyed being an only child for about a year. But then Her new owner passed away so we found another home for Buttercup at age 11. Unfortunately Buttercup became ill fairly soon after that adoption and passed away. We are so glad that Buttercup was able to find a good home in each of her moves and we would like to believe that she and her 2 “moms” have met at the rainbow bridge and she is at peace. 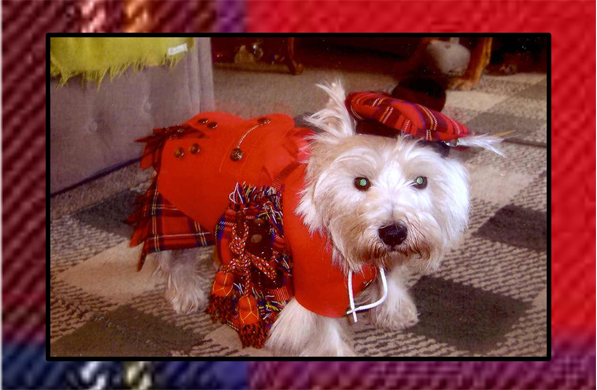 Brady came into our lives as a new puppy…his daddy was a Kilts Westies champion. 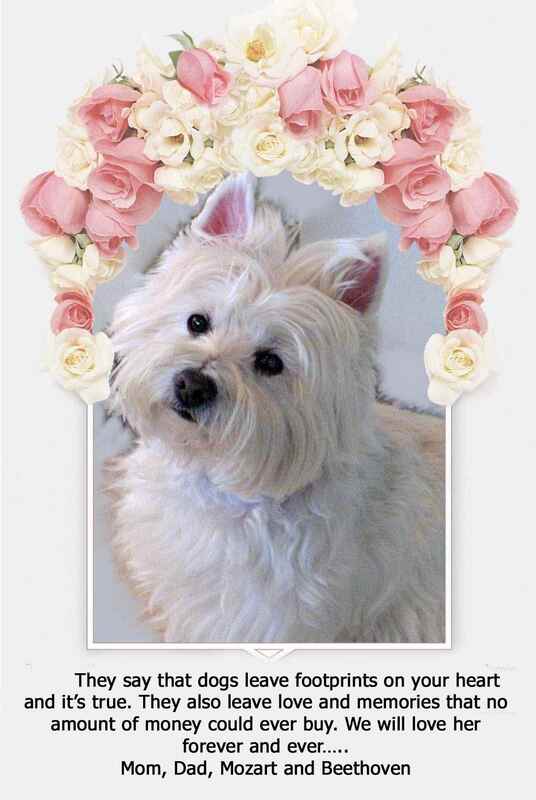 We had recently lost Wesley, our first Westie and Brady licked away our tears and brought joy into our lives again. He immediately formed a deep bond with his human Mom. He never let me out of his site. He was such a happy boy, and made each day special. Kisses, kisses, kisses…is how he greeted me every morning. 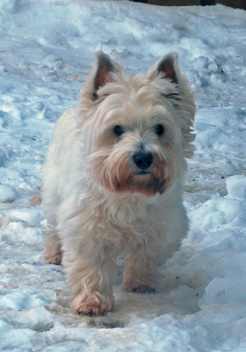 He loved to play in the park behind our house when we lived in Hartland, and chase bunnies under the bushes and keep the geese out of the park. 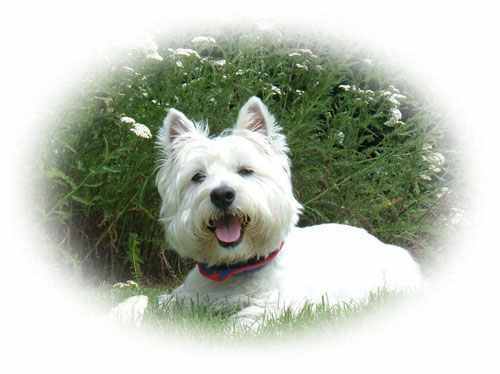 He enjoyed wading in the lake and playing on the beach with his Westie sister, Wendy. 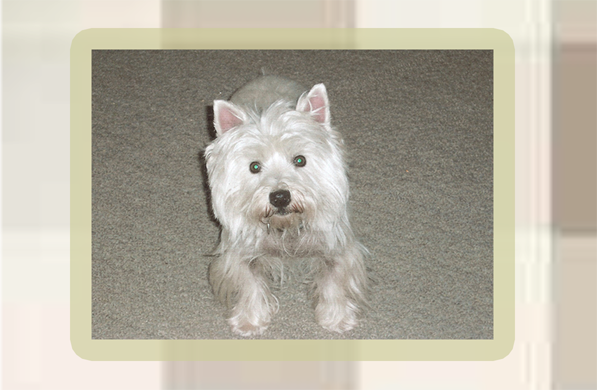 When Wendy passed away, he welcomed rescue Westie, Cody into our home. Their BIG adventure came when we moved north to Lake Ann. Walking the wooded Lake Ann Pathway was their greatest joy, as well as long walks along Lake Michigan shoreline. Brady and Cody enjoyed introducing all of this fun to their new rescue sister, Penny in 2009. Brady was a handsome boy, with an adorable Westie prance. I loved to just watch him trot, tail raised high, as he went down the pathway on his adventures. But besides being joyful and loving he was the bravest soul I know. He suffered from inflammatory bowel disease beginning at 18 months old and had some times of bad tummy aches and vomiting. We fixed him up with special food and medication when needed. After his 15th birthday he began having some seizures and then developed kidney failure. To help him feel better and flush away the toxins, I treated him at home with Sub Q fluids. How it broke my heart to poke him with those needles…but he seemed to understand and took it all in stride. Then on top of this he developed lymphosarcoma. Still, he greeted each day with all he could muster and made the most of it. In the last few weeks we took one last walk on the beach and one last adventure on our favorite path. On our final ride to the vet, he lay cradled in my arms and nosed his way to rest his chin in the crook of his Daddy’s elbow. The circle of our love was evident. As he took his last breaths, I told him to go up on ahead of us on the path and see what adventures he could find, and we will be right there behind him….always….he will always be in our hearts. We love you Brady, our precious little boy! My Glennie passed suddenly and unexpectedly. He got sick around 4pm on Saturday and was in the hospital at 4am Sunday. He made it to about 10am Monday morning. He had diarrhea at first but soon was bleeding out and throwing up blood. They worked so hard but could not stabilize him. The Addison test was negative and the autopsy showed nothing. At this point they believe he had a bone marrow disease that made it impossible for him to fight a simple “bug”. Another possibility is Hemorrhagic Gastroenteritis. Glennie was my little Rescue boy who came to me so afraid of men. We sent him on a 3 week ride with a truck driver so he could learn to trust men. Another year of daily outings and eventually he learned that not all men are bad and scary. He worked so hard to do the things I wanted him to do. He was so shy that things were not easy for him. But he got his CD. I didn’t think he could do it but I entered him when I entered the others so that he wouldn’t feel left out. He got 5 legs out of 5 tries! And he was the “hot dog Toto” in the Wizard of Oz this spring. He loved being on stage. http://www.youtube.com/watch?v=GjuPui92HcI This is my only video of him. Glennie did earthdog from the time he was 3 until he was ten and never managed to earn a leg. I spent his first few years teaching him how to bark but he never could do it underground. We began to request that he be the last dog in just in case he stopped half way and refused to go forward or backward! He was just too nice a boy to go and bark at that rat who wasn’t doing anything but sitting there! Glennie got his novice agility titles but could never manage to get through open. He did everything perfectly but he never understood about “time”. He was my southern gentleman who saw no reason to rush. He did Rally and earned his RAE. I was so proud of him because it was a very hard task and he never gave up. He earned his Versatile Dog Award from the Westie Club and he so deserved it! He loved his sister dearly. Molly was his bellwether. She adopted him about a month before I did. He watched her and if she said something was okay, then he would be brave enough to try it, even when it was just meeting someone. She loved him dearly. And he was the glue between Molly and Jake. They will have to work out a new relationship now that he is gone. He was big brother to Jake. When Jake first came, Glennie refused to look at him. I believe he thought that if he didn’t see him, he wouldn’t be there. But then Jake finally was well enough to play and suddenly Glennie found a use for a little brother. Then he began to take care of and watch over him. Glennie was the “good little boy”. He hardly ever did anything that deserved a reprimand. He was so perfect it was hard to believe. Except that twice in his ten years, he found and chewed up my dental appliance! I remember when he was about a year old, I was planting some trees in the backyard. I would dig the hole and Molly would come over and look over the edge. Glennie would sneak up behind and goose her and she would fall in the hole! Then a big chase would ensue. He was such a great little brother. I don’t know how we will go on without him. Somehow we have to be reinvented. But no matter what, we will never forget him. Once the shock is over, we will find a way to honor him every day. Our website is www.westiedreaming.com. You can see photos of him under his name and under Our Family. (The Manninophotography.com link there shows some especially beautiful professional photos taken just this January.) Please go to TRUCK RIDE to read a very special letter about his early truck ride experience.